IMG Studios delivers multiple 24-hour sports channels and enables coverage of some of the world’s biggest sporting events, often having to shoehorn in new projects to tight deadlines. So, in planning its next infrastructure upgrade, for installation in the Summer, ease of scalability is its first priority – which has led it to IP. It is currently evaluating IP routers, because “we have outgrown our current router capacity,” explained Richard Bagnall, head of engineering, live operations and channels, IMG Media. Rather than buying another SDI router it plans to move to IP. It hopes to have the new router in place before the Rugby World Cup this Autumn, for which IMG is the co-host broadcaster. It will bring feeds back to IMG Studios in West London, as an aggregation point for RWC content and a back-up hub, particularly for broadcasters that don’t have a presence in Japan. Currently, “everything is available to be routed anywhere, so we have ultimate flexibility on how we can use the equipment we have internally, but the downside of that is we have had to invest a lot in router technology.” The building has 200 incoming fibres and 200 outgoing, plus a satellite dish farm with five fixed antennae and two steerable. It currently uses Miranda routers, controlled by BNCS, which also controls the dishes and IMG’s Riedel talkback system and Tallyman tallies. The big attraction of going IP is scalability. Given how IMG has grown over the years, it has to be easy for it to add a lot of capability very quickly to respond to new projects as they come in. With UHD, HDR and potentially 8K on the horizon, “we have to have that ability to absorb those new technologies and IP routing gives us that ability,” he explained. To enable the expansion, IMG has taken over a floor in the building next door, where it will move production staff, freeing up an area upstairs that will take transmission suites that currently surround the MCR, which will allow the MCR to spread out. One of IMG’s main projects is working with the UK’s Premier League. It takes in video from each stadium, to create and distribute feeds of each match. “Part of that production is the Premier League Content Service, which is a 24-hour channel, based in this building, distributed to any rights holders around the globe” – mainly Asia and the Americas. About 25 broadcasters take the channel, which can either be re-broadcast whole (with locally inserted advertising), or used to take individual programmes or news. The channel includes 11 different magazine shows per week and every match – some live and the rest shown overnight. Each game is also offered live, and there is a clips channel, offering “a continuous feed of highlights of the games, while the games are ongoing.” This contribution channel goes to the some 90 licensees worldwide. 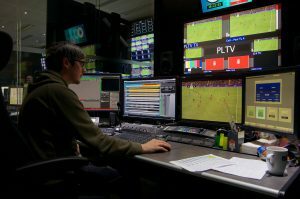 To create the slightly cut-down match re-runs, the game is edited on EVS in the gallery, to produce a 104-minute package containing most of the match (particularly the second half), plus some build up and post-match press conferences. Transcode and transfer would have taken too much time, “so we needed a server that could play our in-house codec (DNxHD 120) quickly and efficiently to avoid the bottleneck of that transcode.” It found its answer in the then newly-released Dolphin server from Pebble Beach (it took delivery of the first two Dolphins), which could play DNxHD 120 natively. It has stayed with Dolphin since, with eight systems now. It used Pebble’s Neptune automation to start, but when IMG did a technology refresh three years ago, it moved to Pebble’s newer Marina automation. When it started with Dolphin, it streamed material from IMG’s central storage, “which was then a bottleneck for us,” but the move to Marina with new Dolphins allowed them to access more storage, giving them much faster throughput along with better protection for the channel output. Because its rights cycles are three years, it tries to keep the technology consistent for that period, and is now planning its next refresh, which will happen over the Summer, in time for next season’s football. It is looking at introducing SCTE markers (‘cue tones for the 21st century’), as a way of informing broadcasters not only when ad breaks are coming up, but how long that advert is, what kind of media is within that, so that they can best utilise that break. “I think we’re in a really good position at the moment, because we’re still mainly HD. There are two UHD games offered per round (one each day). We haven’t any plans yet to move to UHD as a channel offering, so we’re effectively as far down the chain with HD as we need to be,” he said. 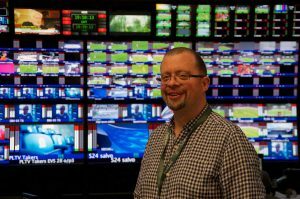 “The one thing we will be looking at is maybe controlling an EVS to do quicker playouts rather than having to do a transfer – we can use the EVS [at IMG] as a remote VT and playout the games directly,” through the Dolphins. The channel currently offers a stereo English mix, stereo mix and effects, and a Dolby E stream (which may become Dolby Atmos, depending on its use by the host broadcasters – BT Sport and Sky Sports). Although it can cope with UHD, HDR would require an upgrade – probably for its vision mixers. Seven broadcasters take UHD games natively currently, mainly in Europe. “We don’t see UHD as a primary driver at the moment, but we’re a commercial entity; if that’s what people want [for the channel], that’s what we’ll offer.” He doesn’t see that happening in the next upgrade cycle. IMG Studios has nine live galleries and four production control rooms for its four studios, with up to 11 of those in action on its busiest days (such as the last day of the season). The live galleries can control any studio. The Pebble Beach Dolphins can act as a completely integrated channel under Marina control, although the Premier League Content Service uses it as a hybrid, using Vizrt graphics, with Dolphin’s internal graphics just for Breaking news straps – it uses Pixel Power’s Clarity for graphics on other channels. Its other major channel now is Sport 24, the first live sports channel for airlines and cruise lines. It launched in 2012, with Sport 24 Extra added in 2016. It “exploits the fact that there is very little competition for sports rights in international waters and international airspace, so IMG holds the rights for a lot of tier one sport [in those regions], and it is available on 13 airlines and ten cruise lines – on about 750 planes” including Etihad, Emirates, American Airlines and Lufthansa. It had more than 3m global viewers for the 2018 FIFA World Cup and more than 1.2 million consumed minutes during the Super Bowl. Sport 24, which runs off three Dolphins, shows live action from more than 30 global sports federations including the UEFA Champions League, Bundesliga, Rugby World Cup, FIFA World Cup, NBA, NFL, all tennis grand slams, all golf majors, and the Olympics. It also takes the Premier League Content Service as a source, taking games with some magazine and news programming. IMG doesn’t do any one sport with the same intensity as the Premier League, although the night SVG Europe visited it was also doing six EuroLeague Basketball games, plus snooker for Eurosport. It also produces a weekly highlights show covering the English Football League for Quest, and is a rights holder for Serie A football. It has also been outputting Eleven Sports’ channels, using three of its Dolphins as channel-in-a-box systems – but using Clarity graphics. Social media and online work is increasing. “We’re seeing more people trying to embrace that OTT and social media side. The EFL show for Quest has its own 15-minute programme that was on Facebook and is now on Twitter. IMG tends mainly to be B-to-B, but the social media interaction is usually broadcaster-to-consumer, and that is not the space that we tend to exist in. We’ll do it on behalf of clients, but that’s not our main driving force,” he said. 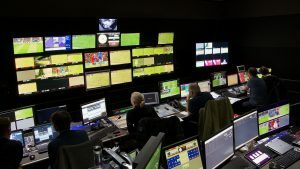 However, for something like the Premier League, “we’re trying to cover everything that a broadcaster would want in terms of content to give to their clientele,” including clips that broadcasters can put up on social media.